For over forty years, 78-86 Nerang Street Southport has been home to the only BMW dealership on the Gold Coast, Queensland. This 5,968 square metre corner positioned site has been offered for sale for the first time in over four decades and as such represents an extremely rare opportunity to acquire what is arguably the most iconic corner in greater Southport CBD area. The marketing agent is Michael Willems from Ray White Commercial Gold Coast. At present, 78-86 Nerang Street is tenanted by a major BMW dealer - Motorline Holdings - who currently own the Motorline BMW dealership in Springwood. Motorline is a very experienced operator and has recently signed a brand new two year and a half lease with a single one year option. The property has an annual net rent of $1,034,000.00 p.a + GST + outgoings. The property is prominently positioned on the corner of Nerang Street and High Street in Southport. High Street is a dual carriageway that passes North-South through the heart of the Southport Medical, Automotive, and Bulky goods precincts and connects Labrador, Southport and Bundall. 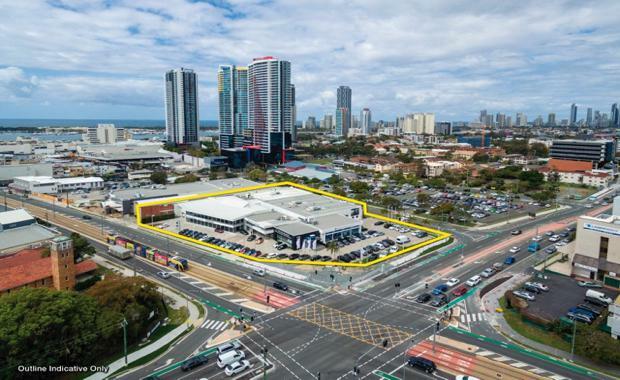 The property has a 45 metre frontage onto High Street, and a 90 metre frontage onto Nerang Street, and as such, is easily identifiable when travelling through the intersection in any direction. Southport is the original and dominant central business district of the Gold Coast. With the most office space on the Gold Coast, and significant mixed-use developments underway in the area, Southport has been granted a special development zoning under the Priority Development Area scheme. The Gold Coast BMW building is located very close to the heart of Southport connected via Nerang Street, Suter Street, as well as the recently completed Gold Coast Light Rail network. The property is located within 300 metres of both the Gold Coast Light Rail Nerang Street and Southport stations, China Town, and within 600 metres of the Woolworths, Coles, K-Mart and Event Cinemas anchored Australia Fair Shopping Centre (undergoing a $25 million renovation), as well as the Southport Central Commercial Complex. Furthermore, 78-86 Nerang Street is situated within an important precinct for the 2018 Gold Coast Commonwealth Games. Approximately 5km away is the $500 million Commonwealth Games Village featuring a mixture of 1,252 apartments and townhouses. The Village is one of the City’s largest urban renewal areas. Closer to the property is the newly completed Broadwater Parklands and the $41 million Gold Coast Aquatic Centre; both legacy projects of the Games and were built specifically to cater for the influx of visitors and for aquatic events. The 2018 CWG is seeing a raft of public infrastructure expenditure across the City. As such, 78-86 Nerang Street Southport, Queensland, provides a rare and unique development opportunity not to be missed. The Urban Developer is proud to partner with Brand Territory to deliver this article to you. In doing so, we can continue to publish our free daily news, information, insights and opinion to you, our valued readers.